Are too many police officers currently suffering from engineered mental instability? The wave of police brutality in America and the world suggests this may be true, but just how big is this problem and is all of this engineered? First, without question there are still excellent police officers throughout America that go to work every day and carry themselves in a professional manner. Unfortunately these good and well meaning police officers are having to bare the weight and the burden placed on them by other so-called 'bad' police. But what exactly is underneath all of this? Even police that act violently often mean well but have rationalized their own behavior to justify what they do. Let's examine this closer. Police, like our military men and women who are forced into situations they would rather not be in, are now being counted on to carry out over-reactive injustices on American citizens. Every day we are hearing about police shooting, killing, tasering and beating to death Americans (and even their dogs) who had no charges against them, were not even read their Miranda rights and didn't get a chance to be heard in front of a jury of their peers. The stories of police executions nationwide are almost daily. So what can be said about this phenomenon? It appears that in many if not most cases the police officer genuinely thought that what they were doing was justified, however irrational that may sound. Note that these officers do have a cognitive train of thought that justifies what they do. This train of thought is no longer random (not that it ever was). Police are now 'trained' to think in a way that is very dangerous to all Americans. Whether it's the man reaching for his cell phone only to get shot and killed because the officer sees a gun, or whether it's the person simply running away from the police. The person running away doesn't realize that the police officer sees things dramatically different from how civilians see it. To bridge that gap of perception Hollywood regularly feeds the masses a long list of TV Cop shows and police activity based movies. This effective strategy empowers the police to do as much as they can get away with, hoping the (TV watching) public will 'connect' with police perspective. Nonetheless, the person who runs away from police must realize that police see a man that is better off dead than to be a man who got away. They see someone running away as a terrorist who is running because he is a super dangerous now discovered terrorist. They may not even consider the basic logic of 'police equals jail' and 'no one wants to go to jail' or 'no one wants to be beaten and murdered by a police, thus run'. These statements would perhaps fall under 'silly human logic' or 'big mistake' to the officers involved. In fact recently a police chief thought it "odd" that a woman who felt she was being hit on by a motorcycle cop did not want to talk to the officer. Is this really odd? Or police logic? The lady felt that the officer was acting like a sexual predator thus she tried to ignore him and exercise her right to not speak with him so he eventually chased her down, tackled and arrested her for not acknowledging his approach. One lesson learned here is that police minds are 'sincerely' wired into a logic that is entirely disconnected from the paradigm that you and I live in. 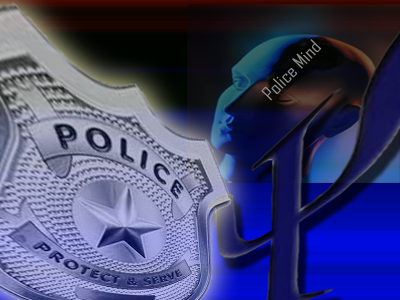 In this modern society which has perfected the art of mind control, it shouldn't require too far a stretch of the imagination to realize that police are trained by some of the most effective mind training systems in existence. Imagine what it's like to be trained into thinking that anyone in your own country can be a suspect, a criminal or a threat to your life. Under any other circumstances this would be considered a clinical disorder of paranoia. But what about when your job requires you to be paranoid? What if you are an officer and you genuinely believe that man's cell phone to be a gun? Who is responsible for this paranoia which has led to the murder of Americans on an almost daily bases nationwide? Did anyone confront the Nazi's about their potential mental disorders? Would anyone have listened? This police violence phenomenon has put police nationwide, into a position which can now be arguably described as a position which involuntarily, systematically, and gradually is turning otherwise good men and women into mentally deranged zombies exclusively operating to protect and enforce an inhuman, immoral and robotic legal system which enforces laws and rules which have no moral, logical, or reasonable justification. This disconnect from humanity that police are being forced to practice is psychologically unsustainable to the average person. In order for police to maintain mental homeostasis and continue feeling like themselves, they need to internalize and reconcile the behavior they are exhibiting, look to each other for "moral" support in whatever actions they take and develop some kind of thought pattern and camaraderie that allows for these behaviors. Ever notice how police actually sound different in their thought patterns and speech? That is because they actually do think differently. Many Judges and Attorneys also deal with this phenomenon. Police however, are tasked with putting their lives on the line to defend the same legal system that Judges and Attorneys defend and uphold every day. I recall working as a doctor years ago and how all my doctor friends and co-workers agreed on the 'doctor' paradigm. This is about paradigms, and police face the most troubling mental paradigm training. To solve this police violence problem one must first acknowledge that these paradigms exist throughout our society. We could be talking about the military paradigm, the bankers paradigm or the real-estate paradigm. We call them "careers" but these can be viewed as life-styles. From a psychological point of view, I offer the concept of paradigms. The focus here is on the police paradigm which is shifting to a dangerous area because of how it is triggering unpredictable violent behavior on the part of many officers nationwide. It's important to note that the Diagnostic and Statistical Manual of Mental Disorders (DSM) the official American Psychiatric Association rule book for defining mental disorders states that a Mental Disorder is characterized by a behavior or psychological syndrome or pattern that occurs in an individual that reflects an underlying psychobiological dysfunction. Exclusions have been historically applied to account for the (social) context of the behavior. DSM essentially is saying that if you obeyed authority, then you are not crazy or have a mental disease. I differ with this idea and believe we have to take into consideration the entire situation. What should we call it when an entire system is built to collectively apply an unstable psychological mental process (or paradigm) into the person's mind? Perhaps the time has come to rewrite a 'natural medicine' brand of psychology that does not hide the truth about human behavior into modern day contexts so as to shield the larger systems of evil and oppression. Why should we subscribe to any set of rules about what constitutes normality and mental disorders when the rule book is being drafted by the very control system that looks to keep the overall prison planet agenda intact? Just recently it was reported that the American Psychiatric Association now considers the behavior of self photographing (commonly referred to taking "selfies") as a mental disorder. This new disorder, of course, will be treatable with pharmaceutical medication. With claims such as these can we continue to trust the DSM and the APA to tell us what is and isn't a mental disorder? Even more interesting is the newer definitions of mental disorder that the DSM is now implementing. New definitions are said to be highly subjective and focus on the biological definition confirmed not with biology but with subject lists of behavior observations. The depth of this growing problem of subjectively defining what mental disorder is without actual proof, should not surprise anyone aware of the new world order agenda. Let us no longer kid ourselves or be afraid to confront the evil that surrounds us. America is diving deeper and deeper into a very dangerous and violent police state. And the soldiers carrying out the mission don't think like you do. You will have to reconcile what is at the root of these societal problems. This is but one angle of the problem we must all deal with. Ultimately, tyranny and fascism is a mental disease where the person is acting in a disconnected manner to that of his or her fellow human. We are dealing with a control system whose own psychiatry text books state that a person who inflicts suffering and pain upon themselves has a mental disorder, yet that same person can inflict the same pain and suffering on another and not be considered mentally handicapped. Doesn't that say something about our own violent nature? Violence really is a diseased state of mind and we are now surrounded by violence. This diseased state of humanity is being expressed in many different ways including wars, invasions, prisons, environmental terrorism, state sponsored terrorism and the ultra violent police state among many other ways. We need a collective effort to pinpoint police to a proper starting point. If I could say one thing to police it would be that we need them all on our side. We want to see those officers who are honest and respectful of humanity and freedom to stand up tall and wave your hand. You, the honest, respectful and honorable officer who has integrity, are desperately needed now. Like the call for a 'few good men', we really do need a few good men to step up. At the recent Bundy Ranch confrontation we saw sheriffs, veterans and many others who were willing to step up and be counted. We need likeminded police officers throughout our entire nation not brainwashed zombies willing to pull the trigger and murder Americans who transgress the corrupt legal system. Police must realize that the life, safety and well being of a person is more valuable than the legal system even if they know the person has done something illegal. They must realize Americans are not terrorists and Americans love good honest cops. Like any other job, career, lifestyle or paradigm, police will upon leaving their job and moving on, see the world from the humanity (non-police) point of view again. Those that have been in the military are familiar with the so-called return to civilian life. This return to civilian life should remind us of the dangers of "departure" from civilian life and the mental consequences that come with it. In China recently, at least one police officer was murdered and four others seriously injured by an angry mob who felt it was justice after one of the corrupt officers murdered an innocent man with a hammer. Clearly many would argue that the officer who committed the murder deserved it but can the same be said of the other officers who assisted or stood by? Or were these corrupt officers a victim of this very engineered police psychosis we speak of? Unfortunately police are but one of the victims of the police state and are also collateral damage on the road to tyranny, as are the countless civilians who will die in the implementation of the new world order. Perhaps our society will grow in such a way that we examine police from a more psychological stand point. A solution that would both identify and purge the engineered and existing underlying mental instability that currently hides within the ranks.